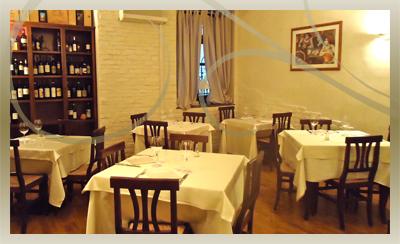 A well-furnished hall with wooden shelves enriched by wine bottles and old objects evoking Piedmont tradition: this is what meets guest's eye, a smart and cosy restaurant just near Alessandria Cathedral. You are welcomed and put at your ease with unforgettable professionalism and politeness by people always ready to attend you and guide you in your choices. Here you will enjoy a modern way of cooking without nevertheless leaving out some important dishes of Piedmont tradition. Bread, pasta, as well as jams, sweets and ice creams, are homemade: we put here all our passion in order to make our guest evenings pleasant. Here you can taste, for example, hors-d'oeuvres such as duck breast salad with walnuts, foie gras and onion flat bread, first dishes such as rabbit green ravioli with roasted pine nuts and marjoram, main dishes such as stewed small squids stuffed with wild rice and topinambur cream or desserts such as puff pastry with meringue and chocolate with green tea ice cream and orange sauce. Before the meal guests are served an appetizer and at the end, to accompany the coffee, our restaurant small pastry. 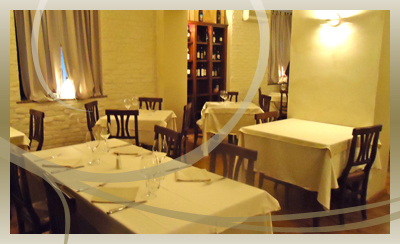 We offer also an excellent selection of whiskies, grappas and liquors: we want to give many good reasons for making you understand the philosophy of the Duomo Restaurant of Alessandria.